The conclusion of The Walking Dead: Michonne is now upon us, and Telltale’s first attempt at a game miniseries is over after just three episodes, rather than their usual five. While I was certainly generally positive about the first outing, I had a very enthusiastic response to its follow up and crossed my fingers hoping that the finale would also impress me like the original game did. What We Deserve ends up landing firmly between the two previous instalments as far as my overall thoughts go. It does a good job of gradually ramping up its tension and action, as well as feeling like a proper finale both plotwise and thematically. Where the game stumbles, however, is in its length, as well as the series’ trademark choice-making mechanic. There’s not much of it, and what’s there feels a lot less important, personal, or difficult to decide as earlier games in the series. 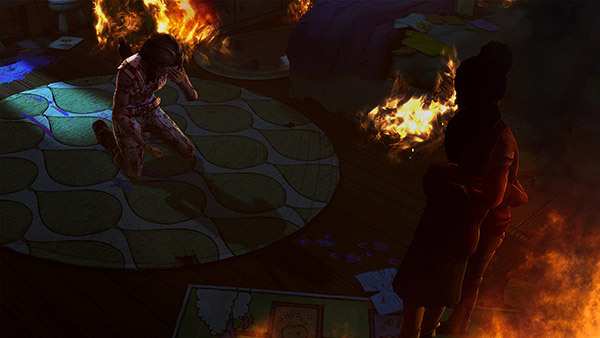 The first two-thirds or so focus on Michonne, her fellow survivors Pete and Sam, and a few other characters introduced in the last episode, as they recuperate in an isolated home and are forced to prepare and deal with a visit from Norma, the intimidating leader of a colony Michonne had some unfortunate encounters with. The later portions don’t exclusively deal with this confrontation, though, as Michonne’s post-traumatic hallucinations of the daughters she lost in the early days of the Walker apocalypse come to a head at the same time. The interactions Michonne has with these characters are well done, particularly Sam’s much younger brothers, who will remind longtime fans of Clementine in how ill-equipped they are for the world of this series and their ways of coping with its harshness. Despite the ominous and rather bleak buildup behind it all, there’s also a feeling of tenderness that the miniseries hasn’t displayed up to this point. The climax doesn’t have much that will surprise longtime fans of the franchise, with quick time events and carefully aligned cursor inputs again taking center stage. There’s also a pretty gruesome death scene for one character in particular that definitely felt like a callback to classic Romero flicks. I’d previously stated that I found Michonne’s hallucinations more jarring than anything, and while there are certainly some sprinkled throughout the finale, I appreciate that the story doesn’t decide to devote itself to them until the main conflict is mostly settled. While I was an overall fan of the first Walking Dead‘s tearjerker ending, Season Two‘s conclusion was a series low point for me, due to most of the multiple endings lacking a big impact and a shockingly lethargic and disconnected pace for the first two acts. What We Deserve is less ambitious, but I think it’s to its benefit. The slow points work because they genuinely build on what the first two episodes had established, both the initial standoff and final fight with Norma pack good tension and fast-paced action, and you aren’t left feeling like there are loose ends, something I thought both main seasons were guilty of. The main issue this time around is a lack of reliance and resonance with Telltale’s trademark choice-making. It’s been well-known for years now that choices in their games rarely have huge ramifications and there’s only one story path regardless of what you do (Save for Season Two‘s aforementioned branching endings), but I’ve been okay with that, since it still is a successfully immersive mechanic that makes me feel like I’m putting my own personal spin on the story. While it’s not like choices are sparse here, they don’t feel very important, or in the case of the pivotal final choice, the right choice is very obvious rather than the sometimes difficult dilemmas we’ve seen before. I did go back and choose the less rational choice, and while it did have dire consequences, the impact felt lessened by how unlikely it felt to me that people would choose it, as well as how virtually the same closing scene plays, with the optional tragedy feeling like a footnote. 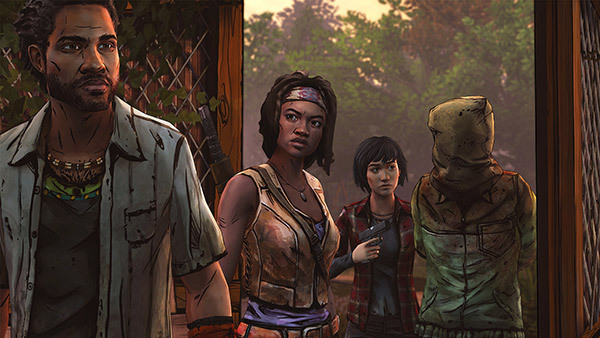 It also doesn’t help that, in sticking to the lore of the comics, fans will go in knowing that Michonne and Pete live to fight another day no matter what they do here, while the fates of Lee, Clementine, Kenny, and Telltale’s other original characters were always in question. I’m not against familiar faces from the source material making cameos in the upcoming Season Three, like Hershel and Glenn did in the first game, but hopefully the central cast will be game-exclusive again. In a move that will surprise absolutely no one at this point, What We Deserve is once again extremely short, clocking in at barely over an hour. I’ve made this complaint in so many recent Telltale reviews that I’m basically expecting it to become the norm with the developer, and it makes me speculate that with more ongoing projects than ever before, maybe they’ve been spread too thin. Technically speaking, the PC version of the game generally ran fine at maximum graphical settings for me, though the odd graphical glitch still happened, most notably a bag that Michonne was holding vanishing during a fade to black. Thankfully, the long and frequent freezes I mentioned in the last episode were absent here. I’ve listed a lot of complaints, and even though I ultimately am giving What We Deserve a lower than usual rating for Walking Dead episodes, I can still say that at its core, it’s pretty solid and definitely a more satisfying ending than Season Two‘s. It’s just that after such an impressive second episode (Why has it become a tradition with this franchise for the second episode of each season to be the best? ), I was hoping that level of overall quality would stick around for every aspect, and the brief playtime and lack of impactful choices prevented that. 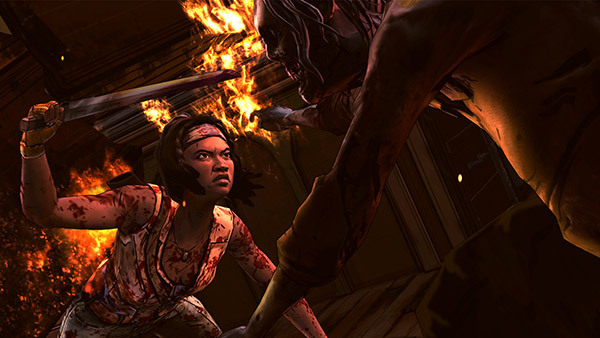 Where Telltale takes The Walking Dead in the upcoming third season is anyone’s guess, but hopefully they’ll take note of what worked and what didn’t in both Season Two and Michonne.